Fifteen years ago, doctors diagnosed Ed Dobson with ALS and gave him two to five years to live. Since that day, Ed has inspired people around the world with his insights on what it means to live well amid the questions, suffering, and hopes that we each face. As Ed reminds us, we can't choose our story. But we can choose how we live it. This powerful collection includes the short films It Ain't Over, Consider the Birds, Be There, My Garden, Ask Forgiveness, Grateful, and Healing. 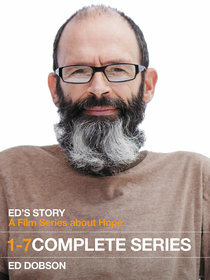 About "Ed's Story (The 7-film Collection)"
Ed Dobson, pastor emeritus of Calvary Church in Grand Rapids, Michigan, serves as an advisory editor for Christianity Today and consulting editor for Leadership. He holds an earned doctorate from the University of Virginia, was named "Pastor of the Year" by Moody Bible Institute, and is author of numerous books, including Prayers and Promises When Facing a Life-Threatening Illness. He moved to the United States in 1964 from Northern Ireland and now lives with his family in Grand Rapids.